Most modern Android based devices support USB OTG function . USB is a Host centric bus that means there is only one Host device and many different Devices can be connected to it. Using inexpensive USB-OTG cable it is possible to swich smarphone USB port from Device to Host, and connect external devices, if chipset and OS build allows this. Google provides detailed information on how to code USB Host  in your application. Categories: computers , electronics , FAQ , software | Tags: android, code, development, electronics, otg, software, usb | By: Tomek Cedro. 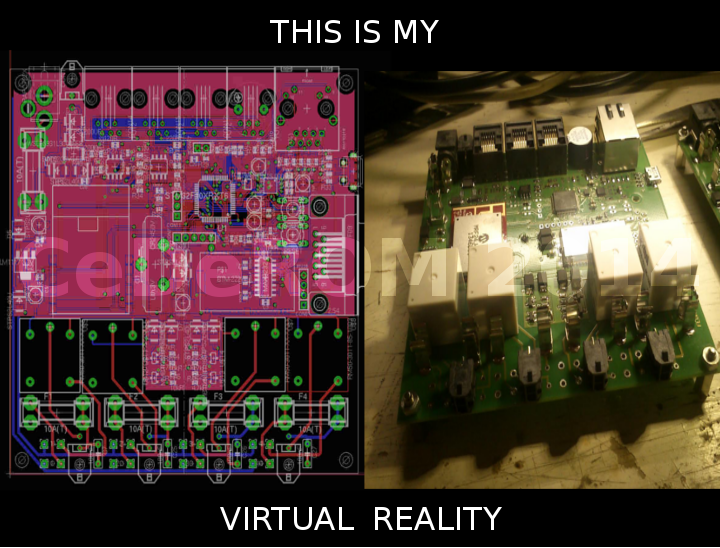 Categories: electronics | Tags: design, electronics, hardware, virtual-reality | By: Tomek Cedro. Today I had a pleasure to give a lecture on my “CeDeROM Brain Computer Interface” at Bio-Tech 2013 scientific conference hosted by Lublin University of Technology. Thank you for this great opportunity and so many interesting people! Categories: electronics , neuroscience , science | Tags: BCI, conference, electronics, inventor, Neural Interface, neuroscience, science | By: Tomek Cedro. Categories: computers , electronics , hardware , modifications , software | Tags: arm, cpu, electronics, embedded, free-software, open source, swd | By: Tomek Cedro. Today, with my friend Grzegorz Misiołek, we have presented a lecture on our early stage research “BioCybernetic Robot with Brain Computer Interface Technology for Space Applications” at II Conference on Aerospace Robotics (CARO’2) hosted by Polish Space Research Center of Polish Academy of Sciences. Thank you for this great opportunity! Categories: aerospace , aviation , electronics , neuroscience , science | Tags: aerospace, BCI, conference, electronics, neuroscience, robotics, science | By: Tomek Cedro. Categories: computers , electronics , hardware , modifications , software | Tags: computer modification, drivers, electronics, embedded systems, free-software, interface, open source | By: Tomek Cedro. Patches that integrate LibSWD with OpenOCD has been already sent, so the platform independent Serial Wire Debug in Open-Source becomes a reality! Mr. Gerrit takes care of the source code review part, while Mr. Jenkins takes care of proper binary build for various platforms and operating systems. This is the right moment to make use of developers mailing list for feedback, asking questions, blaming, testing, adding new features and voting to accept the patches, so the code becomes an integral part of the OpenOCD release! Categories: computers , electronics , hardware , modifications , science , software | Tags: arm, bootloader, computer modification, connector, cpu, electronics, embedded, free-software, interface, LibSWD, open source, OpenOCD, swd | By: Tomek Cedro. LibSWD 0.5 is out! It brings mainly the rename of all function prefix due API conflicts with other existing solutions. Categories: computers , electronics , hardware , software | Tags: arm, BSD, electronics, embedded, free-software, interface, microcontroller, open source, swd, uC | By: Tomek Cedro. LibSWD 0.4 is out! It brings various bugfixes and improvements, but most of all stable API to be used with OpenOCD and other external applications. Categories: computers , electronics , hardware , software | Tags: arm, cpu, electronics, embedded, free-software, interface, open source, swd | By: Tomek Cedro. “LibSWD serial wire debug open framework for low-level embedded systems access” has been presented on FedCSIS 2012 international conference and the paper has been already published by IEEE Xplore Digital Library. All my publications are listed on Google Scholar. Categories: computers , electronics , hardware , science , software | Tags: arm, conference, cpu, data, electronics, embedded, free-software, from scratch, interface, open source, publication, swd | By: Tomek Cedro.